I am trying to determine the total pin power requirements for my Mega 2560 project; it will connect to 3 1m Neopixel strips and 5 RGB laser fiberoptic lights, and control them via PWM. Each strip and light will have its own external power supply. The laser lights will be controlled by an Adafruit TLC5947 LED Breakout board with 3 (R,G,B) inputs. Further, each laser light is turned on by a logic high command. here's my rough schematic: Thank you in advance! Neopixels only need a control signal and Gnd when powered externally - connect the external power supply Gnd to the Mega Gnd as well. The 2560 chip can definitely work with 800mA (200mA per VCC & Gnd pin, and there are 4 of each). The onboard supply can't cope with that - you get a max of 500mA from USB (due the 500mA PTC fuse, the big gold or green part next to the USB connector), or something under an 1000mA depending on how 5V is created. 12V into the barrel jack and high current will over heat the 5V regulator. 7.5V into the barrel will give you a better shot at high current. Then there is 1V rated reverse polarity protection diode between the barrel jack and the regulator. You can't put 5V into the barrel and get 5V out, you need to overcome the diode and the regulator. 7.5V wallwarts work well for that. www.dipmicro.com used to carry 7.5V/1A wallwarts, I don't know if they still do. If you decide to use an external 5V source via the power header, then the power headers are only rated for 1A current as well. I use this one for 5V projects, 4A to power the Arduino, make yourself a power cord splitter and have 5V for other stuff as well direct from the wallwart, and not off the Mega board. Are the lasers controlled by current into the R,G,B pins, or are they externally powered and R,G,B are just control signals? If their power comes from RGB, then you'll also want to power the TLC5947 seperately and just connect control signals and Gnd to the Mega. Not the answer you're looking for? 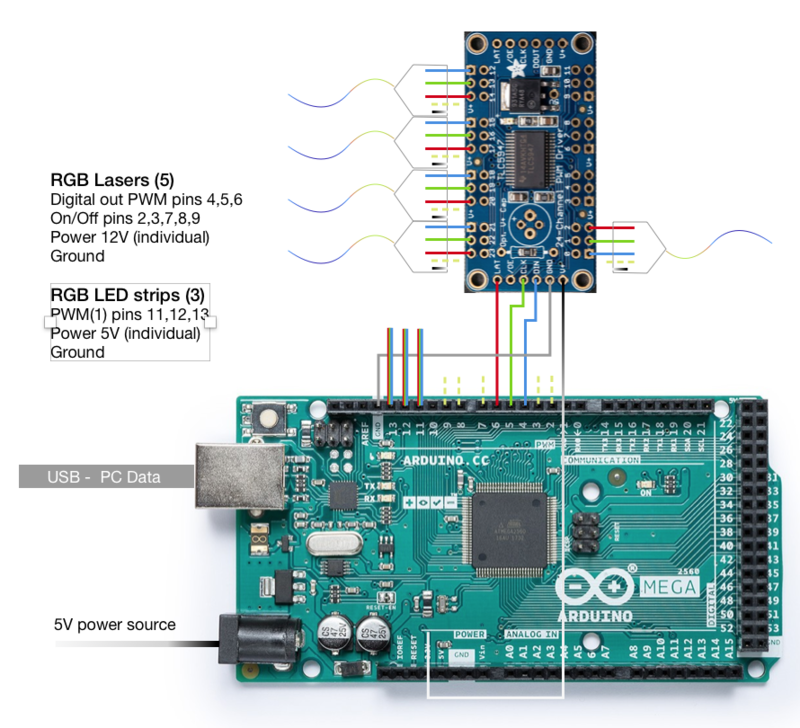 Browse other questions tagged arduino-mega power pwm or ask your own question.